Today I’m really happy to have Rachel Holland on the show. 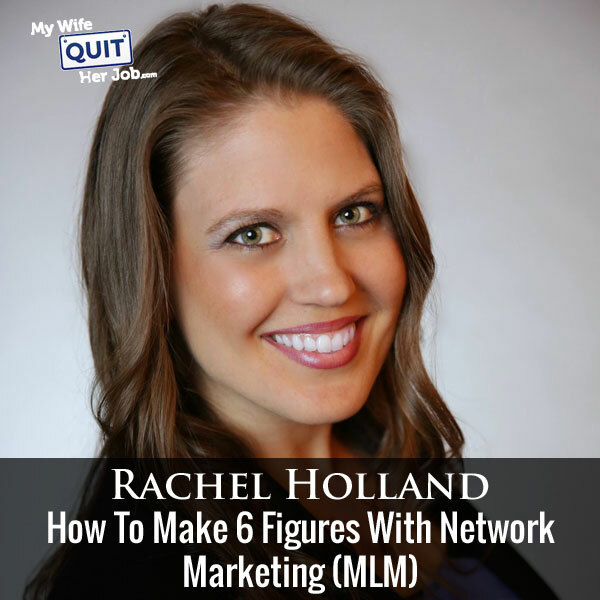 Rachel is someone who I was introduced to by a friend and she is killing it in the network marketing space. Rachel runs the popular site Surviving The Stores where she teaches others how to save money and live healthy on a budget. She and her husband Ryan run the site together and have turned it into a huge resource. Anyway up until this point, I have not had anyone doing network marketing before on the podcast and I’m very curious how it works. Enjoy the interview! Steve: You are listening to the My Wife Quit her Job Podcast, the place where I bring on successful bootstrapped business owners and delve deeply into what strategies are working and what strategies are not with their businesses. I’m Steve Chou, and today we’re talking with Rachel Holland, who was introduced to me by a good friend. Now Rachel runs survivingthestores.com, and the reason why I want her on is to discuss the ins and outs of network marketing. In other news I wonder that you know that tickets for the 2017 Sellers Summit are now on sale at sellerssummit.com. Now what is the Sellers Summit? It is the conference that I hold every single year that specifically targets ecommerce entrepreneurs selling physical products online. Unlike other events that focus on inspirational stories and high level BS, mine is a curriculum based conference, where you will leave with practical and actionable strategies specifically for an ecommerce business. In fact every speaker I invite is deep in the trenches of their ecommerce business, entrepreneurs who are importing large quantities of physical goods, and not some high level guys who are overseeing their companies at 50,000 feet. The other thing I can assure you is that the Sellers Summit will be small and intimate. Last year we cut off ticket sales at around 100 people, so this event will sell out quickly, once again that’s sellerssummit.com, so go check it out. Steve: Welcome to the My Wife Quit Her Job Podcast. Today I’m really happy to have Rachel Holland on the show. Now Rachel was someone who I was introduced to by Tony Anderson, and she is killing it in the network marketing space. Now Rachel runs the popular site survivingthestores.com, where she teaches others how to save money and live healthy on a budget. She and her husband Ryan run the site together and have turned it into a huge resource. Anyway up until this point I have not heard anyone doing network marketing before on the podcast, and I’m just really curious how it works. With that welcome to the show Rachel, how are you doing today? Rachel: Thank you so much Steve, I’m glad to be on the show with you, I am doing great today. Steve: That’s good to know, there are just so many questions that I have for you about this space, but let’s just start from the very beginning, how did you come up with the idea for Surviving the Stores, and how did it move into the network marketing space? Rachel: That’s a great question, so back in 2008 I was a stay at home mom and my husband was working outside the home, and as everyone knows the economy tanked and we were just really, really struggling to meet our budget every month. Gas prices started to rise and it just killed us. So we looked at our budget and we said, okay where can we cut back, what can we do, and we didn’t have people, we didn’t drive a lot and there weren’t a lot of places that we could cut back. Where we saw that we could cut back was in our grocery budgeting because we were just spending crazy amounts. So I actually started Surviving the Stores as a way to keep myself accountable in grocery budgeting. It has moved from that through the years to end up being a full time income for our family starting in 2010, 2011 and I was able to use that blog as well to launch a network marketing business even though I had no intention of doing that at all. I was actually pretty against network marketing in general. Steve: Okay, I’m just curious, are you friends with Ellen Chase because that grocery budgeting stuff is like [inaudible 00:04:17] early too? Rachel: Yes, Ellen and I are very good friends, I love Ellen. Steve: Okay and so did you start Surviving the Stores to make money in the beginning or was it just a way to document everything? Rachel: Not at all, it was very much just a way to document everything. Steve: Interesting, so how did it gain traction? Rachel: It took off from there, and people found out about the site and grew that way. Steve: Did you do anything to get those media mentions? Rachel: I did not, I mean I know there are classes now at blogging conferences about how to get in the media, but no, but he ended up just finding me. Steve: Okay wow, that’s incredible, okay. So how did Surviving the Stores and not talking about the network marketing stuff just yet, how does Surviving the Stores make money? Rachel: We make money through several ways, the first one being through just general CPM ads, and so and all possible clicks, so Google Adsense or just in ads that when you make money off of impressions to your site, so take photos to really generate a good income. You have to have a lot of traffic to your site. That’s always been a very significant way that we have made money, but also through affiliate links. Since we were a deal site for so long, we would find good deals, and then we would have affiliate links that we would – let’s say Kohl’s [ph] had a good deal online, then we would have an affiliate link over to Kohl’s and say here is how you get this at the best price, so we would make money that way as well. As you can imagine, the fourth quarter was always our best quarter for that for sure. Steve: So this is all physical product affiliate links? Rachel: For the most part, yes. Steve: Okay, because I know you told me earlier prior to this interview that you had grown this blog to six figures without the network marketing stuff, and so this is mostly affiliate and ad revenue? Rachel: Yes. I never did a lot of sponsored posts, that wasn’t something that I – I wanted to blog because once I did start making money blogging, I wanted to be on my own schedule, on my own timetable and so I know a lot of bloggers also make money through sponsored posts and that was not something that we really did often. Steve: Okay, and in terms of finding these deals, like how would you find them? Rachel: Research, lots of research. There are deal forums out there where people get on and search for deals and post deals that they have found, and then others get on and search for it. So basically as the deal blogger, I would get on and look through to see which ones were the best ones, because it’s just a mess I these forums, it’s an absolute mess. So you get on and you search for what the best deals are, and then you can post them as a blog post in your blog. Steve: Interesting, so it’s a manual process, it’s not automated? Rachel: Absolutely, it was completely manual. Steve: Oh wow, so what is the typical affiliate cut then for like Kohl’s you mentioned for example? Rachel: It depends, it depends, anywhere from – there are some affiliates where I’m not going to name any names, but some of them are at 1%. Rachel: You know what, surprisingly those don’t get posted that often on blogs, but then anywhere up to 4, 8, 10%, and then if you work with other bloggers as an affiliate for example you mentioned Ellen Chase. She has several different programs that you can be an affiliate for, and so she pays a much larger percentage than say Kohl’s or Best Buy or any of those. Steve: So would you say that your audience were people that did not have a lot of money? Rachel: You know it’s really surprising because there were some who were in that same place that I was where they just were struggling to make ends meet, but then it’s very interesting because a lot of the people who are looking for deals and who are looking for coupons, they have very good, very established salaries. They are just not trying to make ends meet, but they know how to be smart with their money and save. Steve: Okay and in terms of – outside those major media mentions that you got, what were some other ways that you got traffic to your site? Rachel: Networking, absolutely networking with other bloggers. Steve: Like face to face? Rachel: Yes, blogging conferences, lots of blogging conferences, just networking with people, doing projects with other bloggers where you post about them and they post about you, or you do a series together. I did a series with Tony, actually a few series with Tony over the years, then just think of like that where you are – it’s a reciprocal thing you just, you help them by sending your traffic to them and they help you by sending their traffic to you, and it’s just a great relationship. Steve: Interesting, so when you start out though and you have nothing, like how would you approach someone with a lot more traffic than yourself? Rachel: That’s a great question. Rachel: Just build a relationship with them, for me it was meeting people in person and talking to them, getting to know them, learning about their site. In a lot of ways very similar to what you do with network marketing asking them a lot of questions, learning about what they’re doing, their passion behind blogging, why they’re doing what they’re doing, what their blog is about, what they want their readers to come away from their blog feeling, or just getting to know them, really developing those relationships. Steve: So you could not have gotten your blog to where it is without these face to face in person relationships that you built over time? Rachel: No way, there is absolutely no way. marketing. Can you describe that transition? Rachel: Yes, so I was actually pretty against network marketing for a long time, all of the stereotypes that you hear about network marketing, those were things that I believed because I had experienced it back in college. When I was in college I was a freshman in college and I was looking for a job to make just some extra income and I looked in the paper, the classified ads, that’s before you would just look online or on Monster. I looked at the classified ads and there was an ad that said make your own hours, unlimited income potential, call for an interview, must be a self starter. I said, yes absolutely, that sounds like me, I can do that. So I called and they said, oh we have an interview spot open and they brought me in, I even took a little test on the computer and they brought me back into the back room and said, you seem like you would be a great fit for our company, all you have to do is buy this starter kit, it’s commission only. And so I was then ready to start selling the best knives ever. Rachel: Yeah, it was Cutco, I wasn’t willing to mention the brand, but yes it was Cutco. Steve: The reason why I ask is my friend used to sell those knives when I was younger, yeah. Rachel: They are great knives, I mean their scissors really do cut through a pinning and I don’t know of any other scissors that will cut, they are great scissors. But I lasted about two weeks in the company and it was when they told me to talk to my family and friends while I was brand new in a college town, I didn’t know anyone. And they said, well here you can have the records of anyone who had bought previously and I could go to their house, or I ask them if I could come to their house and clean their knives, and then while I was there I could show them the new product catalog. I did that and then I thought, you know this probably isn’t the best idea for me as an 18 year old college freshman going to people’s house asking them if I can clean their knives. I ended up saying this is a bad gig, this is not something that I want to do, I never want to sell anything ever again, I am done. That’s where I ended off and so for me it wasn’t just a seamless transition into network marketing. Steve: Can we define what network marketing is, I’m pretty sure a lot of people out there listening don’t even know what it is? Rachel: Yeah so network marketing and there are all kinds of wrong definitions out there, but really network marketing is a way to create a residue income that not only can last through your lifetime, but I know with the company that I’m a part of we can actually will our business to our children and they can continue to receive that residue income, but a way to receive a residue income through sharing about a product that you love, and then you believe other people will love. So I would say in a nutshell that’s a good definition of how it works. Steve: So to summarize what you just said, you sell something or you have people that are selling on your behalf and you take a cut of what they sell, and they can recruit their own sellers as well, is that how it works? Rachel: That’s correct and the way that I like to share with people is I talk a lot about sharing because really that’s what it is. Whenever I’ve tried to sell it doesn’t work out so well, just sharing about what I’m doing and if you’re passionate about it, people will be asking you how do I get this, what do I do? Steve: Interesting, okay. And so you mentioned synergy before, you were talking about how transitioned from Cutco and then you had a bad experience there, but then what changed your mind about – you’re doing essential oils now, is that correct? Steve: Okay, so how did that transition take place? Rachel: Well I ended up getting – I was researching essential oils and I had settled on where I wanted to get essential oils from. I had always – you’ll see lots of posts dating back to almost the beginning of Surviving the Stores on natural remedies. That was something I was already interested in; I wanted to get started with essential oils. So I researched several different companies then ended up deciding on one specific company. I knew that I wanted to get started with them but just for the essential oils. I had no interest at all in doing the business in any way and I even told the person that I signed up through. I said my plate is already full, I’m blogging full time, I do not want to end up with marketing again, so I just want to get these products. So for a year I stuck to that and for a year I just got the products, but because they have been so beneficial for our family and because it fits so well with the blog, I started blogging about them, I started sharing on Facebook my experiences and how they were benefiting our family. So people either from the blog or from friends on Facebook would message me saying, okay tell me more, I want to sign up. Steve: Interesting, so actually can you just describe what essential oils are for just the people who are listening who might not know what that is? Rachel: Absolutely, so essential oils are plant extracts and they are essentially the life blood of plant, they are what go through the plant, they give the plant its smell, they do amazing things for the plant, and I believe that they are what God created to work with our bodies, to help our bodies do what they’re supposed to do. Steve: Okay, and so it’s mainly for medicinal purposes? Steve: Health and wellness, okay and so you started writing about the essential oils on your blog and then people started becoming interested in what you were talking about, and they wanted to buy their own, is that how this all started? Steve: And then you hadn’t signed up or anything to sell these things, did it just fall into your lap then? Rachel: Well so one of the things that’s great about certain companies and this is true for the company that I’m with, whenever you get a starter kit with this company, you are not required ever to sell anything, but you do have the ability to share and get a referral check from the company essentially. So we call them a thank you check, so you get a certain amount whenever somebody else purchases a starter kit through your link, it’s like an affiliate link. You can earn through that, through sharing with other people and they purchase, and then you get a bonus or a commission off of that. Steve: This is different than the cut of the sale; this is just a flat commission? Rachel: For their initial kit yes, it’s a flat commission. Steve: Can we talk a little bit about what this starter kit is, like you’ve mentioned it a couple of times but I’m not sure what goes inside of that? Rachel: Inside this starter kit for essential oils there are 11 of the most popular, most used essential oils, because really the world of essential oils can be very overwhelming and anyone who has dabbled in it can say, oh my goodness there are so many things out there. So what the company that I work with which is called Young Living Essential Oils has done is they have put together a kit that has the most popular essential oils, the ones that people would be using every single day. Steve: Okay but if you want to buy a certain set, like do you have to buy the starter kit or can you buy the individual oils that you want? Rachel: You can buy the individual oils as a retail customer, so there are two different things that people can do when they sign up, they can either be a retail customer and they pay a 24% mark up, or they can become a wholesale member by buying a starter kit and then they get a 24% discount forever, and they also get that ability to share with others and earn that commission if they choose to do that. Steve: I see, so how much does this starter kit cost? Rachel: It costs $160 which is absolutely incredible for starting a business. If somebody does go into that saying yes I want to start an essential oils business, for $160 they can, which is an incredible price. Steve: And if I were to just buy like a few bottles of the oils that I wanted to, like how much is each individually, you said that starter kit has 11 you said? Rachel: Yes, it really depends. So you can get certain oils for $5 and then there are oils that are almost $200, so for example rose oil. Rose is just extremely delicate and expensive to distil the oils out of the rose plant, so it really depends on the oil itself. Steve: Does that rose oil come with the starter kit though? Rachel: It does not, but there are some frankincense stuff and frankincense is an extremely amazing and much more expensive oil. So everything in the starter kit, if you were to buy it all separately, it would be over $350, so the starter kit is actually just a really good deal in and of itself for getting started for the essential oils. Steve: I see and it sounds like it gives you like – it’s like a variety pack for example if you’re just starting out it makes sense to get that regardless? Steve: Okay and so now you have the starter kit and you’re using these oils yourself, so how did you transition and how did it work in terms of selling these oils? Rachel: What I did was I created a few Facebook groups and really Facebook groups have changed the game for network marketing. I mean it just really has because even 10, 15 years ago, or five years ago network marketing was done over the phone and that was it, and through emails, emails, snail mail, over the phone. Facebook groups have changed the game because I created, one of the first things I did when I started the business was create a few Facebook groups, and I have for example a Facebook group that’s specifically just for education where people can ask questions about essential oils and how to use them on their family, on their kids, on their pets, all of that, and then another group specifically for those who are interested in learning more about the business. And so in a sense I created like a little bit of a funnel system through Facebook groups which has been really neat and fun to do, and that’s one of the things that I learned through blogging was how to do that. So not only do I have that through email but also in a sense through these Facebook groups. How did you build the Facebook group? Steve: Oh sorry, I meant how do you build members, like how do you add a whole bunch of members? Rachel: Once somebody signs up, I email them and get their email address that they have, and most people, the majority of people have a Facebook account. So I email them and I get their email address that they use for Facebook, and you can add people to the group with their email address. Steve: So this starts from your blog it sounds like then, right? Rachel: Either from my blog or people that I know personally, either way. I’ve built both ways; I have several people that I know personally and then blog readers as well. Steve: So would you say you got most of your downstream people through personal relationships or through your blog? Rachel: Personal relationships for me. Steve: Interesting, so can you describe how that works, how can you get critical mass doing things that way? Rachel: Because everybody knows people, so I have a certain number of people that I know, but then each of those people has a different sphere of people that they know, and then each of those people has a different sphere of people that they know. So everybody has their group and so let’s say I end up signing someone up and they get their starter kit, they love the oils; they are interested in the business. And I say it in that order, because whenever somebody tells me okay I want to get a starter kit because I’m interested in the business, I kind of back up a little bit, because I want them to truly love the products first before they jump into the business side. So once somebody does that, let’s say I enroll somebody who decide that they love the oils and they do want to get started in the business, and if their network is also a large network, then that means that my team and their team grows more quickly, they want to sign someone up who has a smaller network. Really that’s a big part of why it’s called network marketing or relationship marketing. Steve: Okay and how do the economics work, like let’s say you sign someone up, like what is your cut and what is their cut? Rachel: So if I sign someone up, and it really varies from company to company. Every company is going to have a different compensation plan, and that’s one of the things that I tell people whenever they say they are interested in a network marketing business. I tell them to look at the compensation plan, look at the income disclosure, every network marketing company is required to have an income disclosure up there at least I think every couple of years. So take a look at that and see if these are the incomes that you are comfortable with, so every company does it differently. The way that Young Living works which is the company that I’m with is that I earn a commission when somebody buys the starter kit and that commission is $50, and then there is a bonus during their first three months for what they buy during their first three months, and then you get just general commissions depending on the level that they are on after that. So starting in month four you get just regular commissions. The thing about essential oils and really any consumable product, because I would highly recommend for those who are considering network marketing to make sure that it’s a consumable product that you love, that you use daily, that you would use whether or not you are making money, because other people will do the same. So there are – I mean over 90% of the people on my team are not building a business, they are buying these products because they need them every single day. So I just want to commit to anyone who is considering this that that I think would be a very crucial thing in deciding which company that you go with. Rachel: You still get a percentage. Steve: You still get a percentage, but then if they go on and sell starter kits, you also get a cut of that as well, is that correct? Steve: And how does that work, like what are the economics like there? Rachel: Again it varies from company to company. If I enroll someone and then they enroll someone else, I also get a percentage from that enrollment, and then up to a certain level. So all network marketing companies will have let’s say either five levels or six levels that you get paid on. Really there is so much in here, different network marketing companies even have completely different commission chapters like some will do uni level commissions, others will do a binary system which is just kind of I don’t understand that level. Steve: How do your levels work, like I guess I don’t understand how that works, what does it mean to be in a level? Rachel: So let’s say I sign up four people and they are on my level one, and then let’s say each of those people sign up four people, then each of those people will be on my level 2. Rachel: And then if those people sign up people, they would be on my level 3. Steve: Got it, got it, okay so your level one people then I guess what commission do you get off of them with your current company? Rachel: With my current company after those initial three months it is 8%. Steve: 8% okay and then the level 2 guys what is the cut, it’s a smaller cut I would imagine, right? Steve: Okay and then it just trickles down? Rachel: And then four, four, four, correct. Steve: Okay and then how many levels can you have, infinite levels? Rachel: Well so this is where you get into the tricky parts ins and outs of the compensation plans, so there is uni level commissions, and then with our company we also do generation commissions which is when you get to a certain rank, you get an extra percentage off of your team, the what is going on within your team. Steve: Okay this is fascinating, so what is that, like I didn’t quite understand what you just said actually. So after a certain point you get extra commissions? Rachel: Correct, so in my company for example whenever you reach the rank of silver, you get an extra, well that’s called a generation commission off of everyone, off of the entire volume of your down line. Steve: Oh my goodness okay. Rachel: Or to even just to pass me, like it’s wonderful to watch, and I get to be a part of other people having these financial successes and residual income for the rest of their lives. Steve: What does it take to achieve silver like you mention like these different levels, how do you achieve that? Rachel: With our company to achieve silver you have to have to have a certain group volume which is just overall sales essentially in the group. And then you have to have two people on your level one, on your first level who also have a certain amount of group volume. It will vary from company to company and I see people all the time getting to that silver rank within a year. At silver rank the average income is $1,700 a month. Steve: Wow, okay and can you give me an idea of what volume is required to hit silver? Steve: 10,000 okay a month or? Steve: A month, okay, and just for clarification what level are you at right now I’m just curious? Rachel: I’m at the diamond level. Steve: And then what are the advertised incomes for that level? Rachel: That income disclosure says that the income for diamonds would be 20,000 to 50,000 per month. Steve: That’s amazing, okay, and so even though – like even if you just stop doing this altogether, you would still get that income from month to month? Rachel: So we essentially did that. Rachel: Last fall we had this crazy idea to pack all of our things in storage and buy an RV and travel the East Coast in RV. It was an amazing experience, I mean just incredible, we got to go to DC and Williamsburg and [inaudible 00:32:25]. It was so much fun, and I thought that I would be able to work more on the road, but I was not, we were just busy the entire time. I was still diamond during those months, I still made those pay checks during those three months, and three months was as long as we lasted and we said get us out of this thing and into an apartment. We wanted to do a year but no, that was not going to happen with four kids. Steve: So is there any maintenance that you have to do then? Rachel: There is, it really just depends on what you want to do, so I still teach classes because I love to, I love helping people get started, so I still teach classes, I have weekly calls for my business builders. Any of the people on my team who are interested in building a business, I have a weekly call with them where I share with them just something encouraging to help them, and then we do a question and answer time every week so they can bring me their questions and we just talk through those things and brainstorm together. And then in the Facebook groups I post often, different whatever the specials are that month or different things for business, but then I also for people who are interested in the business, I’ve put together a two week boot camp to help them get jump started. It’s actually called the jump start boot camp to help them just start their business, to know here are the things exactly what you need to do to get started on the right foot in a network marketing business, and specifically in this network marketing business. Steve: I was just going to ask because if your downstream people don’t make any money, you don’t make any money either, right? Rachel: Exactly, and that’s the beauty of it, me being successful means that so many people on my team are successful, and there are multiple people on my team who are making six figures as well. Steve: Okay wow, so in terms of your Facebook groups, it sounds like that’s where you do the majority of your marketing, why not just your blog and email, why is Facebook groups better than just like an email marketing list? Rachel: Because I love getting to know the people, I mean I’ve built friends through this, through Facebook groups. Everyone is on Facebook constantly, I mean we’re always on our phone; I mean people even eat dinner on their phone scrolling through Facebook. It gives them a notification when someone posts in the group, they see it through their feed, it’s an easy way for people to ask questions, and also it’s way that I don’t have to personally answer everyone’s questions. So I’m not getting all of the emails, somebody can ask in this Facebook group and then there are other people who can get on and answer those questions instead of me being the one that has to answer all of those questions. Steve: Interesting, okay, and so I think I’m starting to understand how this works now. So getting them to just buy the starter pack is just like the beginning of the journey, right? Rachel: Yes and there are systems like for example the boot camp. I run it through a system where it automatically posts on Facebook, and I run the boot camp also through a Facebook group, that jump start boot camp. So there are definitely systems in place that can help you, a lot of people use a scheduling software like HootSuite or something to schedule posts in their Facebook group. There are so many different systems that I learned as a blogger that have come in handy during building a network marketing company, but yes getting to know the people is such a huge part of that and it’s one of my favorite parts, I love that. Steve: Are these boot camps that you run, are they free or do you charge for them? Rachel: I do not charge, no not at all. I can’t imagine myself ever charging for my team members to go through a boot camp to do something that yes benefits them but also benefits me. And I know that there are some network marketers out there who do that, who will have people sign up and say, now for only 3.99 you can buy my system to show you how to be successful in this. That’s just not me; I don’t want to do that. Steve: So whenever you refer to your team members, are these like your level ones and your level twos? Rachel: And level 20s and level 50s and anyone who is on my team anywhere, it does not matter where. I am a part of helping them get their answers. Steve: Here is a question I had, so let’s say you get to like level – like your 20s for example, is it much harder for your level 20s to make money? Rachel: No, not at all, I’m someone’s level 20. There is a good friend of mine who is actually at the highest level of the company, she’s also a former blogger, her name is Alyssa Francis. She’s at the highest level of the company which is loyal crown diamond, and the loyal crown diamond income is 100,000 plus per month so she is there. She is there, she signed up a year before me, and the person right above her is actually still just a silver, so those who are on your team can rank up faster than you, it really just depends on what you do. Steve: The reason why I asked that question is because there is a cut that happens at each level, but pretty soon doesn’t that exceed 100%? Rachel: It does not because there are some cut offs down there. Steve: Oh okay where people don’t make any money if there is a sale or? Rachel: This is where you get in to the really complicated ins and outs of the compensation plan, but yes eventually there is a time where there are some people may be on your level 13 or level 30 or something like that where you would not make anything off of what they bought, but if you are at a certain rank no matter what if I am a diamond I’m going to be making on average 20,000 to 50,000 per month. Steve: And that’s from – so that number, like what determines where that range you lie on the diamond plan for example? Rachel: A lot of it is determined on how many leaders you have on your team, so for example a leader would be considered silver and up with Young Living, so a lot of that is determined by how many silvers you have. Some of that is determined by how many people are in your levels one through five, but I would say the biggest portion of that is going to be determined by how many leaders you have under you, those other people who have reached silver. Steve: Interesting because you mentioned that other example with your friend who was the ultra diamond or whatever rank that was, the person above her was just silver, like how is that possible? Rachel: Because she didn’t do what needed to be done to get to the higher rank, so it’s not like everybody above me is a higher rank than me at all. Steve: Interesting okay, so what does it take — so you mentioned with silver you needed to have multiple silvers under you, right? Rachel: To get a silver you have to have two groups, essentially groups we call them legs, two groups under us that have an overall volume of 4,000 per month. Steve: 4,000 okay and then what’s the rank right after silver? Rachel: Right after silver is gold. Steve: And then what does it take to become gold? Rachel: To become gold you have to have an overall volume of 35,000 per month and then you have to have three legs under you, three groups under you that each has 6,000 of volume. Steve: I see okay, so that one silver person probably just had that major leg which was your friend? Rachel: Right and then another smaller leg and that was it, she never worked on creating those other legs. Steve: I see okay, so going forward with your business right now, you mentioned that you had the opportunity to go on this really cool RV trip. So going forward like what – do you have incentive to continue to sign on new people? Rachel: Absolutely and I would say even more than money. It is because I have seen these oils change people’s lives, and that truly is my incentive is that I want to get these oils into more people’s hands, because they are what were created to work with our bodies. Steve: Okay interesting and so even today you continue to blog about these oils, you continue to run your groups and your boot camps, and at this point what would it take for you to reach that next level past diamond? Rachel: At this point what it will take, so I have all of my legs in place for the next level, it is just a volume thing right now, so it is just gaining more volume, helping more people learn how to share and sharing with their friends in their network. Steve: Interesting, so is it in your best interest then to give special treatment to your legs? Steve: As opposed to just random people like focusing more on the people who are actually on your team, does that make sense? Rachel: Sure yes, so one of the things about network marketing is that whenever somebody buys a starter kit, let’s say within Young Living, they are automatically a part of a team somewhere. So that way everybody is able to be helped by someone, so my responsibility within the company is to help those who are a part of my team. Rachel: And not that I don’t help overall, I mean I love talking to others and brainstorming with other leaders who are not a part of my team or even not a part of my up line, that is so much fun, I love doing that. I love having what’s called those cross line relationships; they are not your up line or your down line. Steve: Okay I think I’m kind of understanding how this all works now, so the way you build your business is you ensure that the people under you are successful, and then you get these bonuses which push you up to the high bend as opposed to signing up as many level ones as you possibly can. Steve: Okay that’s an interesting business model oaky. You mentioned earlier that it’s in your best interest to sell some sort of consumable and I don’t know, you probably don’t even remember this, but how does Cutco work, like most of the times when you buy certain knives you’re done, right? Rachel: Right oh yes. I could use some more knives, actually I still have my set, but it’s been goodness almost 20 years since I bought my first set. So you’ll see those big ticket items where they are pretty expensive like the vacuum cleaners, I mean how often do you need a Cabby vacuum cleaner, or do you even need one, do you even need a $2,000 vacuum, I don’t know. So a lot of people have that in their head, you know the people that come around to their door and say, hey I just want – I’ll shampoo one room of your carpet for free. A lot of people have that in their head, but yeah it’s just such a different experience now. Steve: Okay and then I had a couple of more questions relating to oils, and so going forward, like your friend who is at the highest level, is she doing the same things you are? Rachel: She is absolutely; she is still very involved with supporting people, because she wants to see as many people succeed in this as well. Steve: Okay, and is she at the highest level? Steve: She is okay, and so really it sounds to me at least that you don’t go into something like network marketing unless you’re a true believer of the product? Rachel: Yes, and I have had people join my team before who were just interested in the money and I tell you what that it faded very quickly, because they were not passionate about the product. So now that is just something that I tell people upfront that the business will not work unless you are truly passionate about the product. Steve: How often do you actually go in person and have like parties so to speak, or is it all done online at this point? Rachel: It depends, there were different seasons for me, there were times where I was doing in person things a lot. We are in an apartment right now and while we’re building a house, and so right now it doesn’t work out super well for me to have in person classes at my house, but I’ll do webinars and then when we move I will certainly have events at my house, but just because I love it. I was at a retreat this past weekend, it was actually the silver retreat for everyone who had reached silver in the company, they invite them to Salt Lake City and you go see the lavender farm and everything, and there was a loyal crown diamond, again that’s the top level on the company. We spoke from the stage and she never taught one single class, she completely built online and got from – bought her starter kit to get to the highest level of the company in 18 months. Rachel: And that’s without teaching a single class and building all online, so it really can be whatever fits with you and with your personality and what you have time for, what you want to do. Steve: Have you ever bought ads for any of the stuff or through your blog, like how did you get people to read the essential oils articles on your blog? Rachel: I had a pretty good email list for my blog, and so that was definitely a part of it. We did run some Facebook ads, that helped back when Facebook would actually show your posts to people. That was good because we had a pretty, we had over 50,000 fans on Facebook and so that was great. Then Pinterest, I would say by far Pinterest was the main traffic generator and sign up generator to our posts, so people would see a post on how do I use essential oils, or essential oils for a healthy immune system, or essential oils for a healthy respiratory system. So they would click on that post, come and read about it, and then decide to sign up to get a starter kit from there. Steve: And to sign up is just a link that leads to some landing page where you can put in a credit card, right? Steve: And so for all these people who are listening who are interested in getting into this, what are some of your recommendations? Steve: Yes sure, of course. because I really do think that everyone should have some kind of residual income, and whatever that is, whether that would be investment properties or whether that’s network marketing, but to really develop some kind of residual income, to do your research before jumping into a company. Can I just say one little quick thing about residual income? Rachel: With our blog, with Surviving the Stores, I thought that we had found residual income. There was one post that we had that we ranked really high in Google for, and we were making $1,000 per day off of that post, and I thought oh my goodness this is it, is this really going to happen? Well Google changed their algorithm, and we ended up on page two, and now we’re making about $5 a day on that same post. And so the things that I thought were residual income ended up not being residual income, and so I love that this, that network marketing really can be true residual income for people and that’s what it has been for us. It allowed us to take those three months off last fall and so on, and I would say ask if you’re interested in a network marketing company, ask if it is something that if your income can be given to your children, if it can be willed because with Young Living the income is willable. That was huge for us; I love that part about our company. Steve: Would you say that a blog is necessary or helpful? Rachel: No not at all. It can be helpful for growing more quickly, but I have plenty of people who are making solid incomes and on their way to making a solid income just from teaching classes and sharing in person with their network. But I would say that whatever avenue somebody uses to grow their networking marketing business, they have to have a network. And so whether that network is online, whether that network is at work and mums at the soccer field or wherever that network is, there has to be a network, there is a reason that it’s called network marketing. And so if somebody just wants to stay inside and not build any kind of network at all, then they are not going to be successful in network marketing, but there are many different ways to expand that network of people. Steve: Okay, hey Rachel I learnt a lot today. If anyone out there has any questions for you where can they find you online? Rachel: They can find me through survivingthestores.com. My Instagram is @Racheleholland, on Facebook I am Rachel Holland and again you’ll see Surviving the Stores, you’ll see Young Living. I also have another website called howtohomeschoolforfree.com, just because we’re also a home schooling family, and I put free resources that we find for home schooling. So any of those places you can find me there. Steve: Is there a contact form on those sites where they can actually reach you directly? Rachel: Yes there is on both of the websites, yes. Steve: Awesome and are you on Twitter as well. Rachel: I am on Twitter, it is survivingstores. Steve: Survivingstores, awesome. Hey Rachel, really appreciate your time; all of this stuff is fascinating to me, because I haven’t had anyone on the show doing network marketing before, so I appreciate it. Rachel: Thank you so much for having me; this has been so much fun. Steve: Thanks a lot for coming on, take care. Rachel: Thanks Steve, you too, bye. Steve: Hope you enjoyed that episode. I’ve always been skeptical of network marketing and MOM, and it was actually good to hear from someone who is actually making significant money from that business model. For more information about this episode, go to mywifequitherjob.com/episode145. Very motivating post. I really enjoyed your presentation!